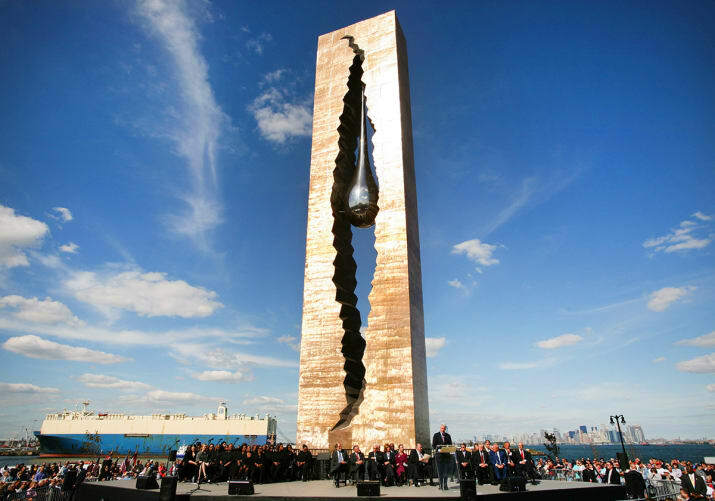 "Monument to the Struggle Against World Terrorism" in Bayonne, New Jersey. Designed by sculptor Zurab Tsereteli, this monument was a gift from Russian President Vladimir Putin and the people of Russia. The National September 11 Memorial and Museum in New York City. 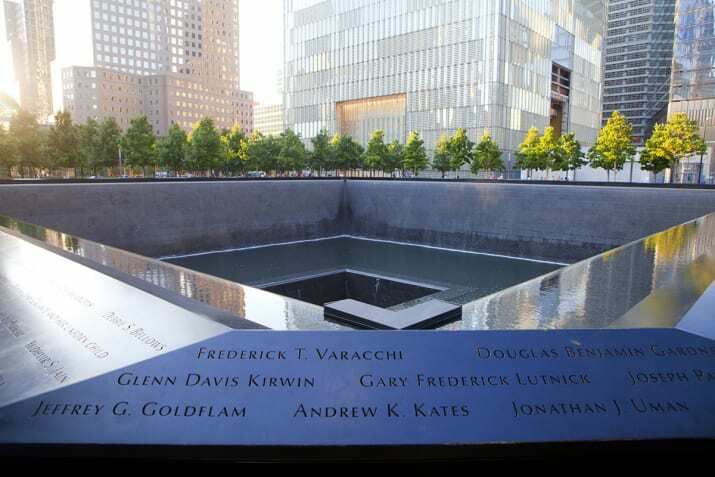 The 9/11 Memorial Pool was constructed at the former location of the World Trade Center. 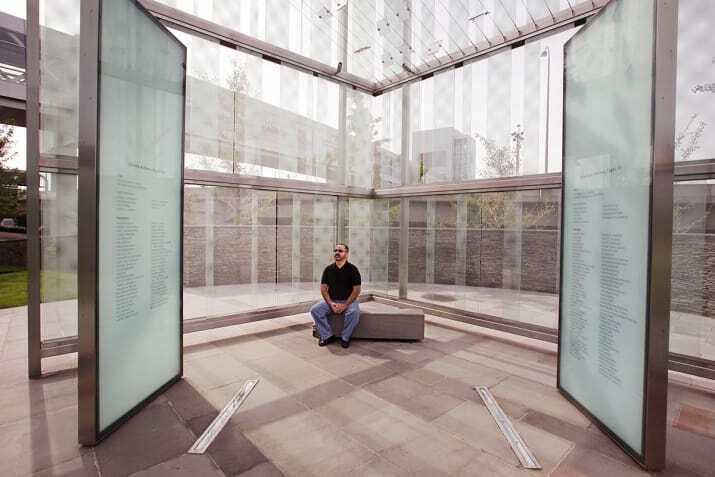 The plaza features two reflecting pools inscribed with the names of those killed on Sept. 11, 2001. 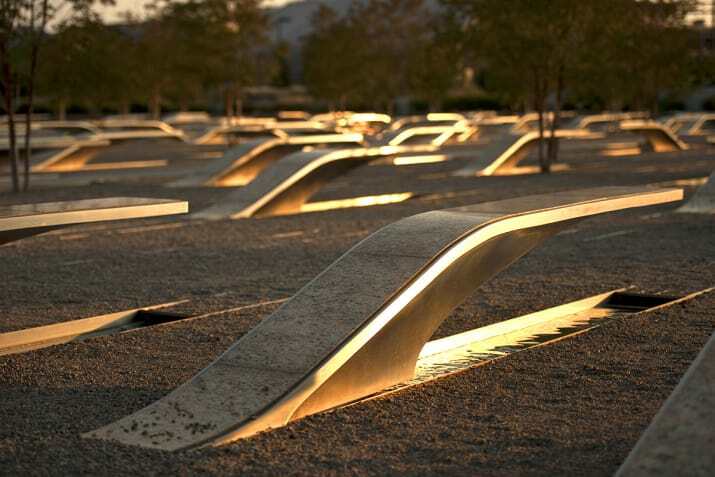 "Pentagon Memorial" in Arlington, Virginia. Each bench outside of the Pentagon is dedicated to one of the 184 people who died in the Pentagon and American Airlines Flight 77. "Collective Memory" in New York City's Bryant Park. 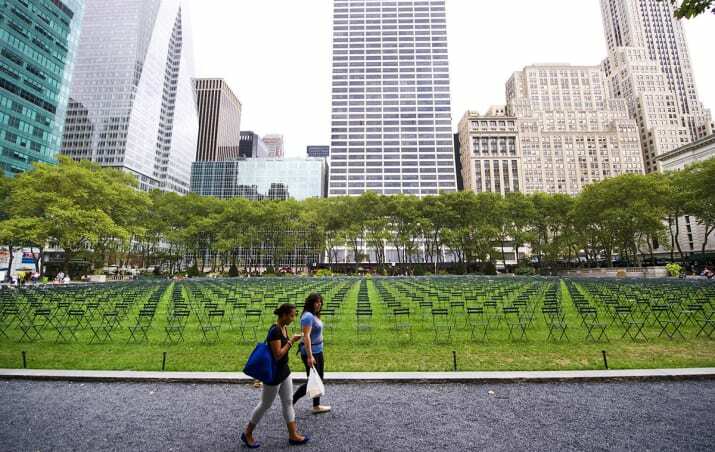 To coincide with the 10th anniversary of Sept. 11, artist Sheryl Oring placed 2,753 empty chairs in New York's Bryant Park to remember each of the lives that were lost. "Reflect" in Rosemead, California. Heath Satow's sculpture "Reflect" is made with a damaged, rusted L-beam from the collapsed World Trade Center buildings. Each of the two hands are constructed with 2,976 interlocking birds representing the individual victims from the 2001 attacks. 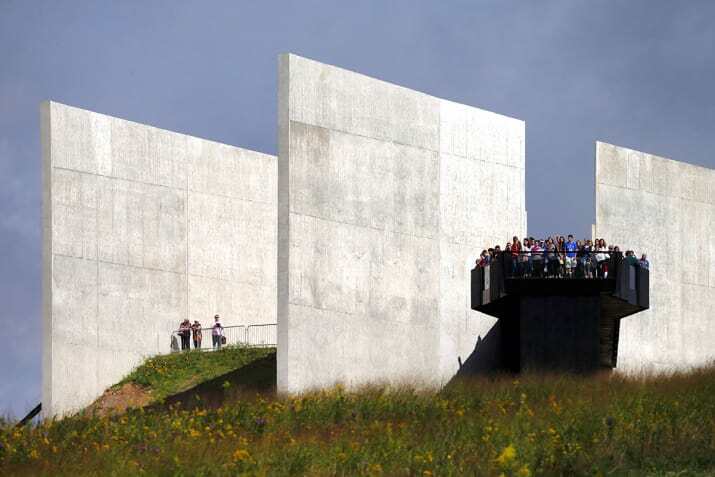 "Flight 93 National Memorial" in Shanksville, Pennsylvania. Visitors are pictured here on the overlook at the Flight 93 National Memorial Visitors Center in Shanksville, Pennsylvania, on Sept. 11, 2015. 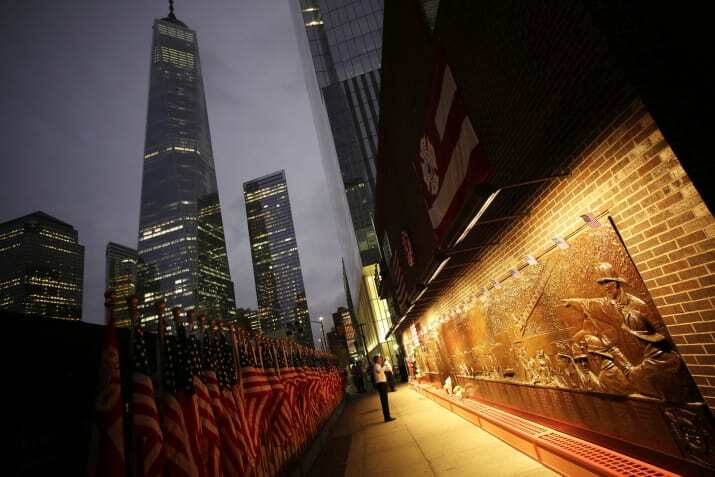 The 9/11 Memorial at New York–New York Casino in Las Vegas. 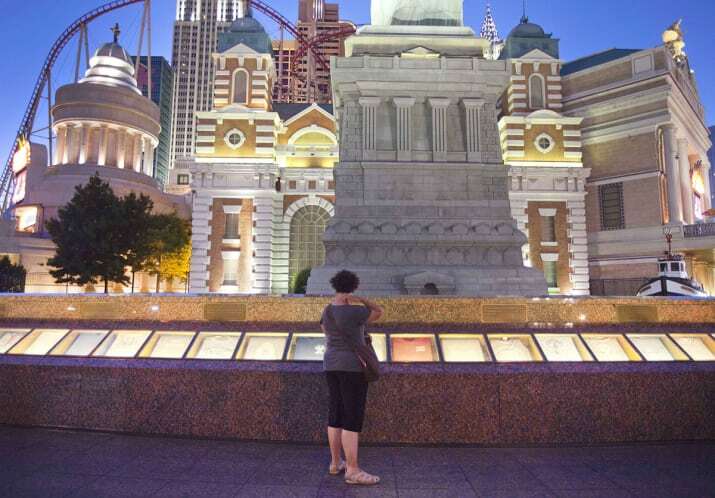 This memorial once held a rotating collection of firefighter T-shirts commemorating the lives lost in the attacks on the World Trade Center, but has since been demolished to make way for a $100 million renovation of the promenade in front of the Manhattan-themed casino and the adjoining Monte Carlo. "Trinity Root" at Trinity Church in New York City. 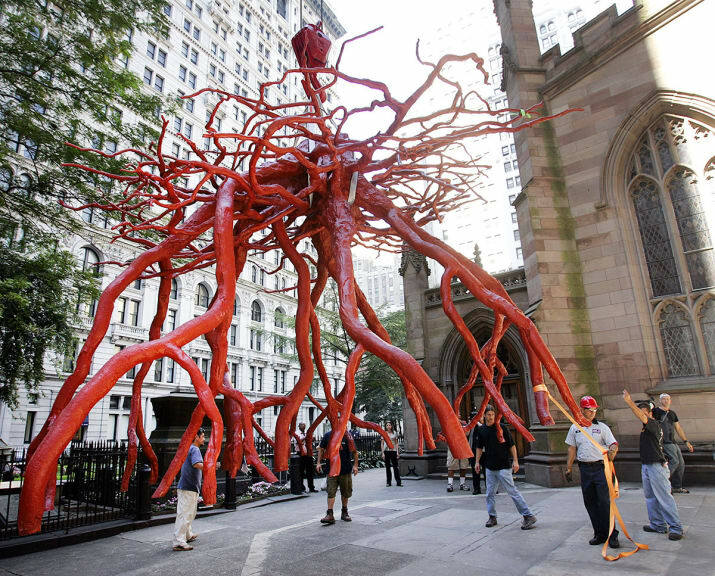 Guided by workers, the "Trinity Root" sculpture is lowered into place by a crane in the Trinity Church yard of New York City in this photo. The 12.5-by-20-foot bronze sculpture, weighing 3 tons, memorializes the stump of a 70-year-old sycamore tree that shielded St. Paul's Chapel from falling debris on Sept. 11, 2001. The 9/11 Memorial at the Public Garden in Boston. 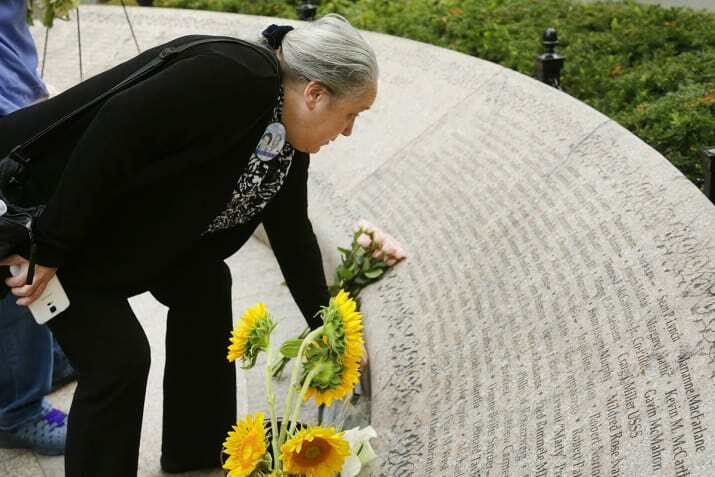 A woman pauses at the 9/11 Memorial at the Public Garden in Boston to honor victims on Sept. 11, 2014. The two planes hijacked by the terrorists that crashed in the the World Trade Center had departed from Boston's Logan International Airport. 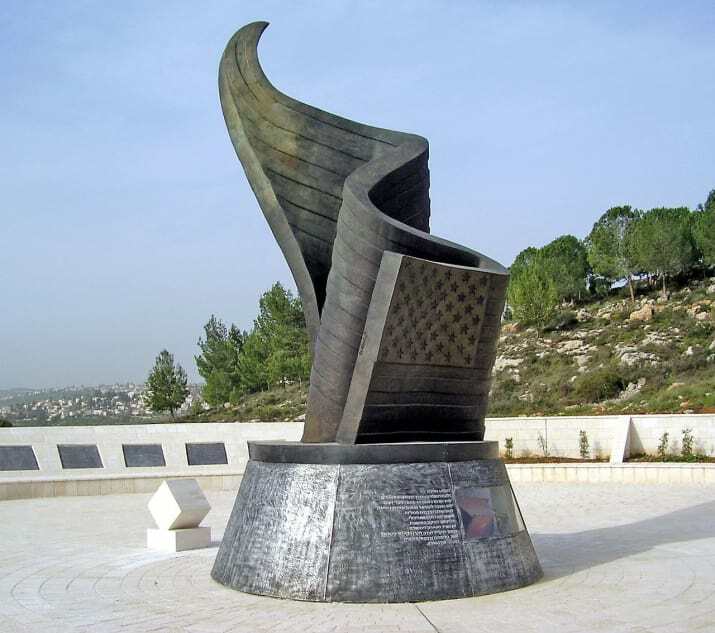 "9/11 Living Memorial Plaza" in Ramot, Jerusalem. This monument measures 30 feet and has been partially forged with recovered steel from the twin towers. Inscribed on the surrounding plaques are the names of those killed in the attacks. The Boston Logan International Airport 9/11 Memorial. Inscribed on two large panes of glass outside of Logan International Airport are the names of those killed on United Airlines Flight 175 and American Airlines Flight 11. "Valor Commitment Dedication" in Grapevine, Texas. 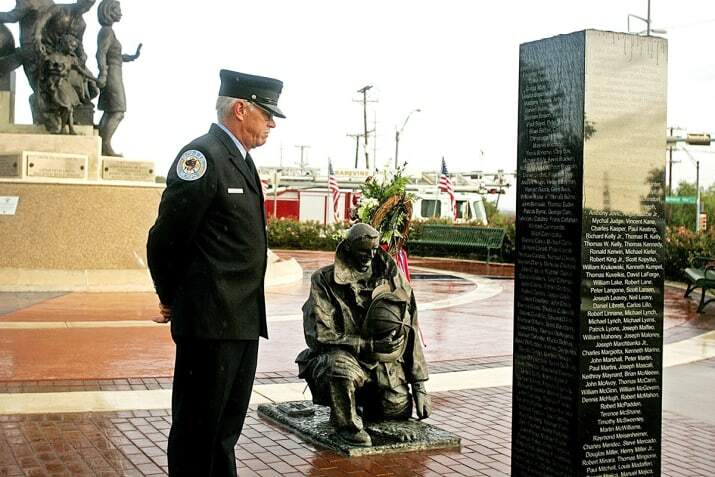 New York firefighter Stephen Humenesky views the monument honoring the firefighters who lost their lives during a 9/11 remembrance ceremony in Grapevine, Texas. Humenesky, who worked on Engine 301 and was at ground zero that day, is now retired and lives in the area. He says he pays his respects here since he cannot make it back to New York. The 9/11 Memorial at the Los Angeles Fire Department Frank Hotchkin Memorial Training Center in Los Angeles. 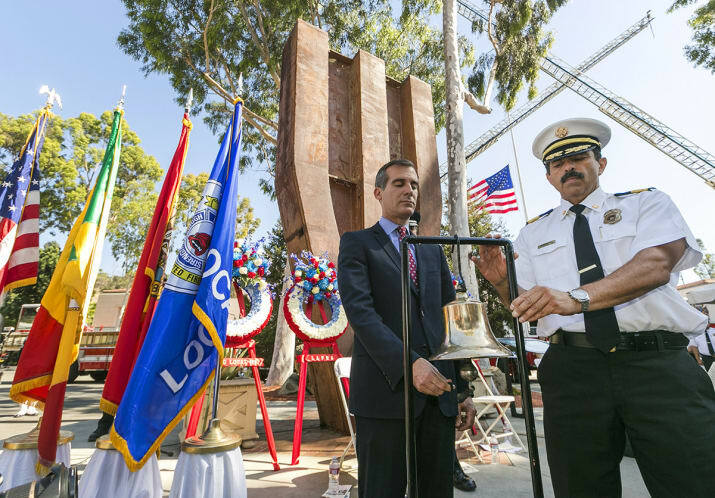 Los Angeles Mayor Eric Garcetti (left) and Los Angeles Fire Department Chief Ralph Terrazas ring a bell at a memorial ceremony marking the 13th anniversary of 9/11 next to the World Trade Center Memorial at the Los Angeles Fire Department Frank Hotchkin Memorial Training Center. "Memory and Light" in Padua, Italy. 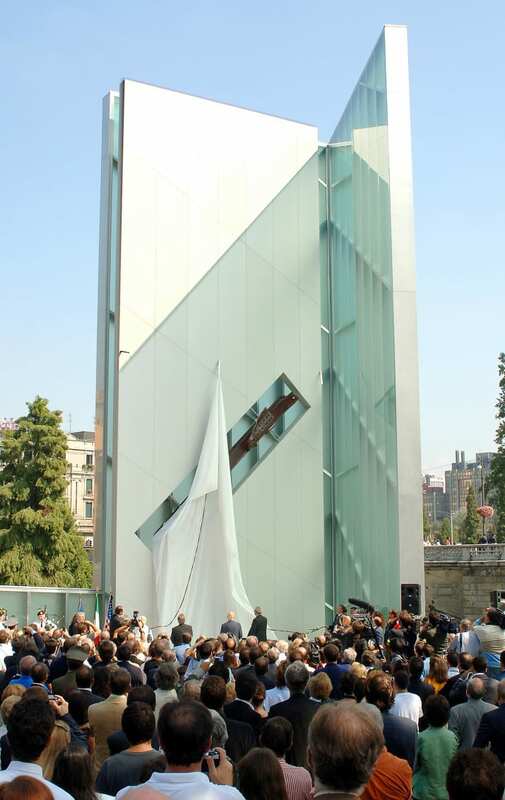 The "Memory and Light" monument was designed by Daniel Libeskind, the architect who created the master plan for reconstructing at ground zero. 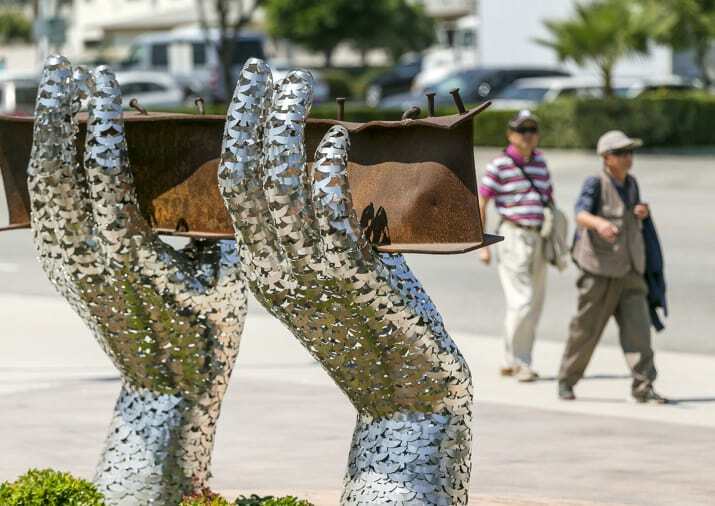 Italy marked the fourth anniversary of the 9/11 attacks with a new glass and steel memorial that incorporates a twisted steel beam from the World Trade Center. "Since 9/11" at the Queen Elizabeth II Olympic Park in London. 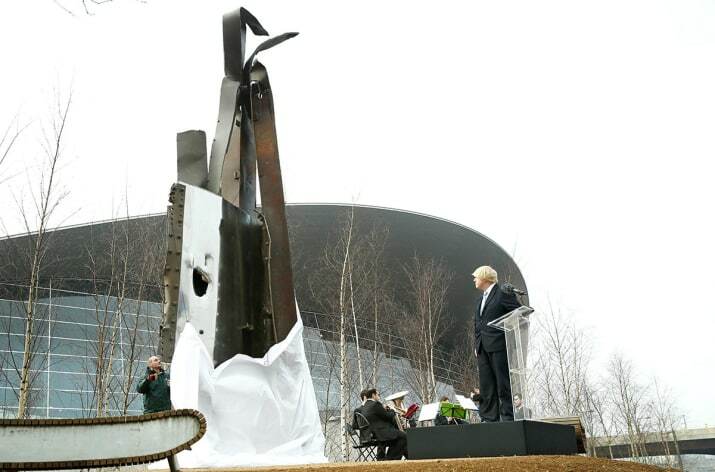 Former London Mayor Boris Johnson unveils a sculpture by US artist Miya Ando entitled "Since 9/11," which uses steel taken from the World Trade Center. The piece was commissioned by a UK-based charity to help educate Londoners about the attack on the World Trade Center and the Pentagon. "FDNY Memorial Wall" at the FDNY's Engine 10, Company 10 in New York City. A firefighter looks at the mural on the outside of firehouse Engine 10, Company 10, adjacent to the World Trade Center. The 56-foot bronze mural honors the lives of the 343 New York firefighters who were killed in the terrorist attacks. "Empty Sky Memorial" in Jersey City, New Jersey. 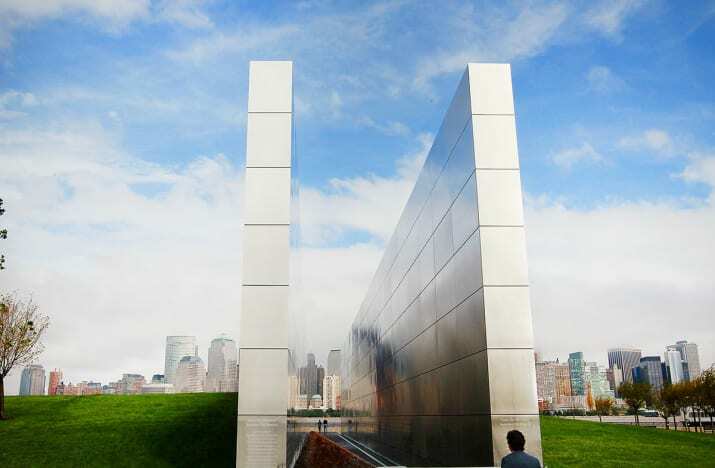 The concrete and steel "Empty Sky Memorial" was designed by architect Jessica Jamroz and pays tribute to the 746 citizens of New Jersey who lost their lives. "Postcards" in Staten Island, New York. On the inner wall of one of the two "wings" comprising Masayuki Sono's "Postcards" monument, flowers are placed next to the names of victims of the terrorist attacks. 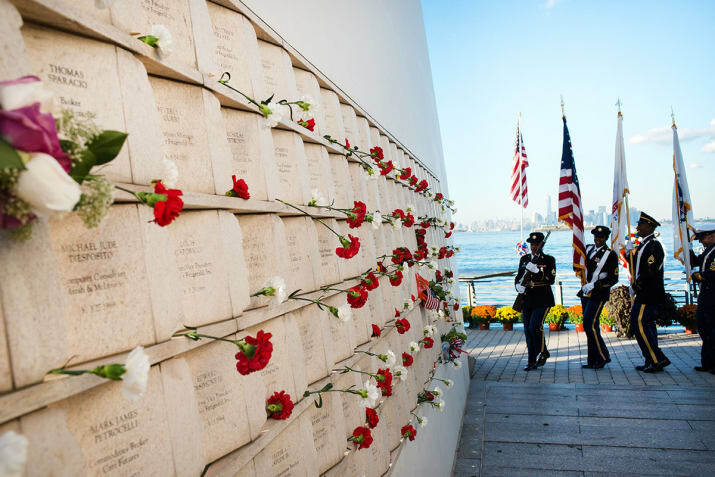 The memorial honors the lives of 274 Staten Island residents who died on 9/11. FDNY Engine 54, Ladder 4 Memorial in New York City. 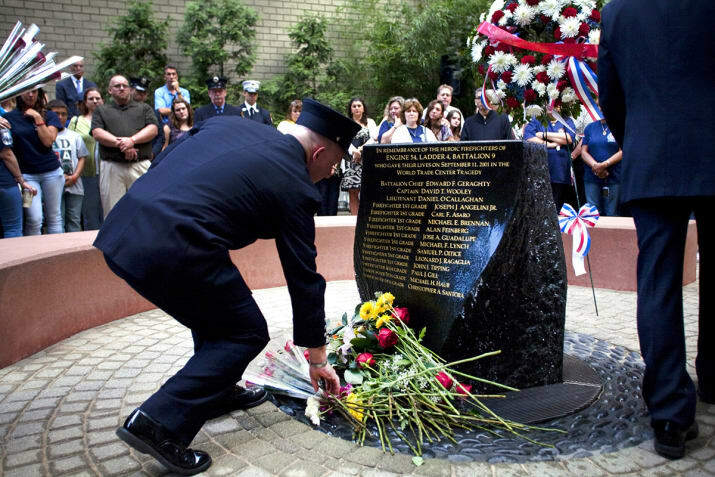 A FDNY firefighter lays flowers at a memorial monument during the 10th anniversary service honoring the 15 firefighters of Engine 54, Ladder 4 who died responding to the Sept. 11 terrorist attacks. FDNY Memorial Wall at the FDNY Headquarters in Brooklyn, New York. A woman touches a name on a plaque in honor of FDNY firefighters who have died from illness related to working at ground zero. The September 11 Memorial Garden in London. 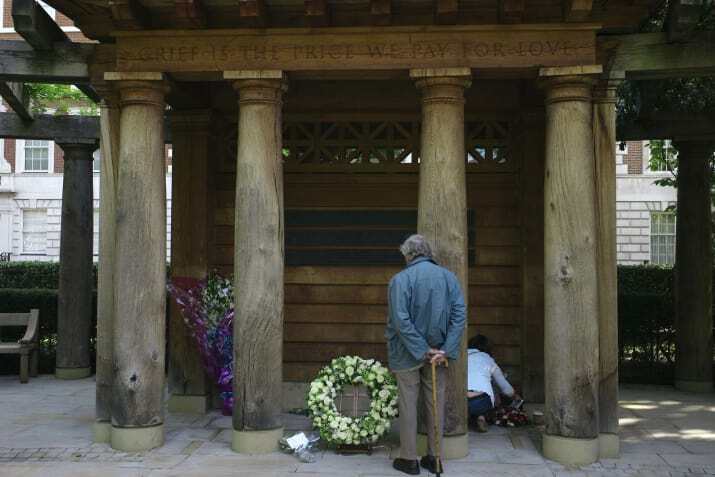 The September 11 Memorial Garden in London was created in 2003 and is inscribed with the words "Grief is the price we pay for love." "Tribute in Light" in New York City. 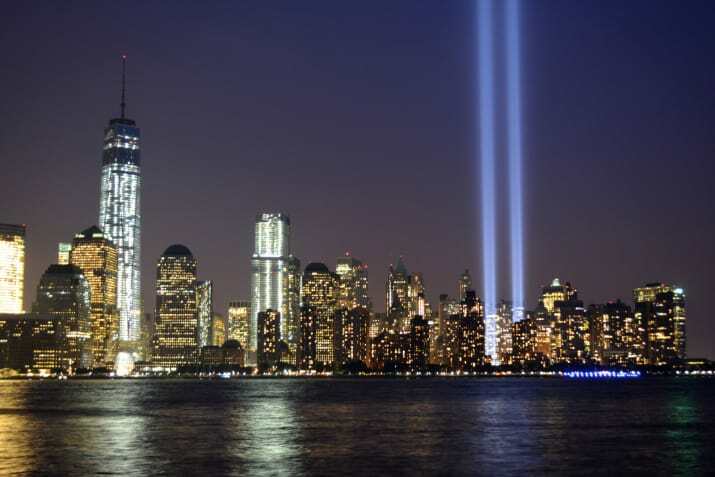 "Tribute in Light" is an ephemeral light sculpture comprised of 88 searchlights placed at near the World Trade Center, projecting two beams of light that echo what was once the twin towers.